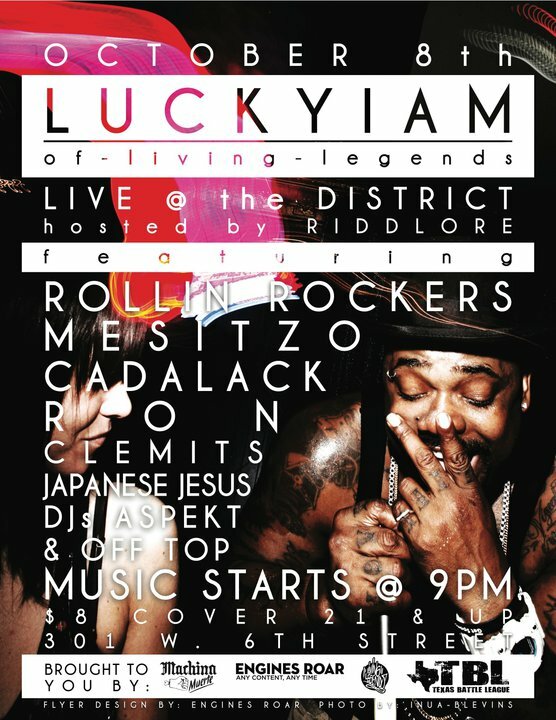 From the Wussup ACL department... Luckyiam @ The District tonight, Oct 8th! Living Legends is a rap group composed of eight hip hop artists from California. Beginning in the early 1990s, the crew garnered a following by recording, promoting, and performing their music independently. The crew is considered by some to be "one of the biggest success stories of the indie-rap movement, [having] sold close to 300,000 units of their various solo and group efforts — all by them-damn-selves." The Living Legends Crew originally grew out of, Mystik Journeymen, composed of BFAP-Brother From Another Plant(now known as Sunspot Jonz) and PSC-Pushin Suckas Conscious(who is now known as LuckyIAM). Beginning in 1994, the Mystik Journeymen began cultivating a fan base by selling their own tapes on the streets and hosting "Underground Survivors" shows in East Oakland. In 1995 the duo met The Grouch, and soon embarked on the first of several of self-funded tours throughout Europe. In 1996 Mystik Journeymen and The Grouch joined with the trio, *Three Melancholy Gypsys of Los Angeles,and to form the Living Legends. The crew has since grown to include Bicasso,Aesop, and Arata. The group and its members have founded and operated several imprints, including Outhouse Records, Revenge Entertainment and their current label, Legendary Music. In 1999, Living Legends moved their base of operations to Los Angeles.